I don’t usually follow Kickstarter that closely, but this is the second notable item for the iPad Pro that I’ve seen this week. While this product has a higher price tag, and will likely take more effort, time, and money to build than the PaperLike screen cover we looked at previously, it is definitely worth consideration. It looks like a creative solution to a problem many users have with the Pro. One of the biggest issues with the iPad Pro and Apple Pencil combo is how to carry and charge the Pencil. As all of us Pro users are well aware, there is no built-in way to carry the Pencil with the iPad Pro. Since the Pencil performs so well, this is really the biggest complaint with it. As for charging, while I don’t have a big problem with plugging the Pencil into my Pro’s Lightning Port to recharge it, there are many iPad users who don’t like this arrangement one bit. It has taken a while, but now we have a contender to fill both of these roles simultaneously. If it gets funded and makes it beyond the vaporware stage, the ProBack could beocome an instant buy for many 12.9″ iPad Pro users. The ProBack isn’t the first case or cover to come with some way to hold an Apple Pencil. However, this cover is slim enough that it is still compatible with Apple’s Smart Keyboard, which definitely makes it unique. The ProBack also has channels around the speakers that help to redirect the iPad Pro’s sound forward. 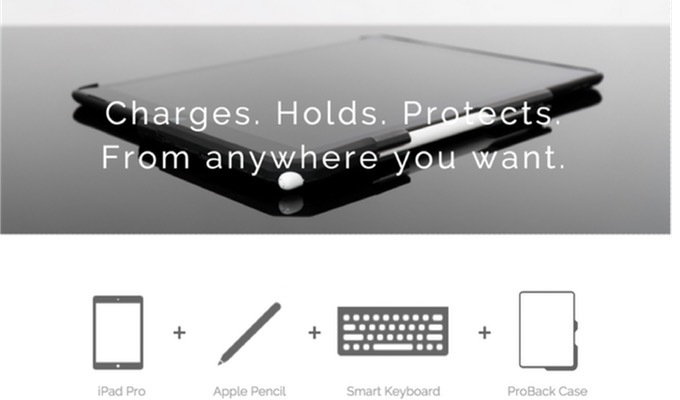 What really sets the ProBack apart is the ability to recharge the Apple Pencil while docked in the cover. It even has a magnet on the top corner to hold the Pencil’s cap while it is charging. 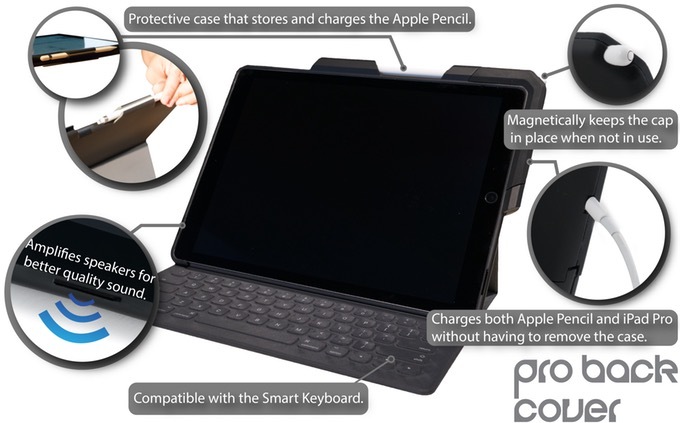 It is the first iPad Pro case to offer all of these features in a single package. All our manufacturing processes have been validated. The production molds for the 12-inch iPad Pro have been successfully completed and tested. We are ready to start mass production immediately upon a successful campaign. There are also pictures and video of their working design and production prototypes, so this looks like a company that will be ready to head right into production as soon as they are funded. The main drawback I see with the ProBack right now is that the Kickstarter only covers the 12.9″ iPad Pro. I have a feeling that Studio Tika might consider a 9.7″ version if this product gets funded, but I guess this is a one step at a time process. The ProBack is currently $39 for one and $70 for two on Kickstarter. This is 20% off of their planned retail price of $49.99. Considering what iPad Pro cases and accessories from major brand manufacturers cost, I don’t think this price is out of line considering what the ProBack claims to deliver. I am still on the fence with this Kickstarter. I funded the PaperLike, and heard from a couple of our readers who did, as well. However, $39 is a bit more money, and there are no guarantees what changes will come with Apple’s rumored iPad Pro hardware updates, which should happen in the near future. This has given me some pause. I haven’t pulled the trigger on the ProBack yet, but I still might. The ProBack has garnered $6,842 and 111 backers as of the time of this writing. That isn’t bad, but they do still have a ways to go to their $25,000 goal. However, there are still 28 days left, so there is still plenty of time for them to get there, especially if word about the product’s possibilities gets out. That’s the reason I’m writing about a second Kickstarter this week. I wouldn’t do it if the ProBack wasn’t very intriguing. What do you guys think of the ProBack? Are you interested? Interested enough to fund the project? Not floating your boat? Been burned before and done with Kickstarter? If you aren’t going to fund it, does the ProBack look interesting enough that you would share this Kickstarter on social media and tell others about it? I’m very interested in knowing what all of you who responded about how you use your 12.9″ iPad Pros earlier this year think about the ProBack. As always, you can leave your thought in the Comments below, on Flipboard, our Facebook page, or on Twitter @iPadInsightBlog. This is not a comment. I use a Brydge keyboard on my iPad Pro. Can this be used together with the Brydge keyboard? 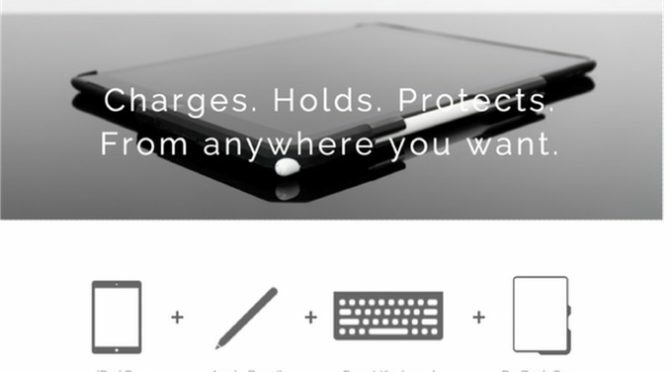 The Kickstarter campaign says compatible with Smart Cover but not sure about yours. Point taken. However, as a daily Windows user and owner of a Lenovo Yoga 2 convertible, I can say with certainty that holding and charging a stylus only goes so far when your OS is a joke when it comes to finger and gesture-friendly tablet use. MS took their shot at a legitimate touch-centric interface with Windows 8 and failed. They aren’t even trying anymore with 10. It’s absolutely useless without a keyboard and mouse other than if you are drawing. Most of the people I know who have touchscreen laptops rarely use the touch functionality, same as me. And I bought the first Yoga because I though I would love it and use it all the time. It’s a step backward from a mouse in Windows, so why bother. So, both the Surface and the iPad Pro have their strengths. And their big drawbacks.